This blog post is dedicated to Corin Pilling. Indie music (typified by bands including but not limited to The Stone Roses, Happy Mondays, and The Farm) was mainstream in the early 1990s. And ‘Restore My Soul’, the final song on The Choir’s Circle Slide, was the most indie-sounding CCM track I knew at that time. 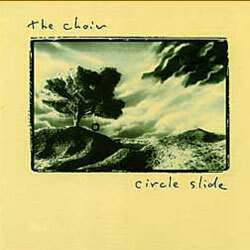 But Circle Slide is not just another instance of nineties guitar music. Circle Slide holds up. When I listen to Happy Mondays or The Farm, for example, I realise how dated they sound. But Circle Slide still sounds like it could have been released today. The songwriting is astonishing, the guitars mesmerising, the lyrics haunting. Circle Slide is one of the best albums ever conceived. I don't know any 'The Choir' songs at all, funnily enough. I'm off to listen to this album on Spotify. I like 'Blue Skies' and 'Circle Slide'. The rest is decent background music but doesn't stand out I'm afraid. I agree with your observation about 'Restore my Soul' though. It's interesting to note that they're still going as a band! Yes . . . and some of their more recent stuff is quite good, but it doesn't hit the heights of their 80s/90s output. If you're wanting to try out some of their other stuff, Chase the Kangaroo is quite U2-ey (at a time when only U2 sounded like U2 - not like these days when every Christian worship band wants to be U2! ); Wide-Eyed Wonder has some really good, offbeat tracks; and Speckled Bird (which came after Circle Slide is very good to listen to, too. Thanks. Nice bass line. I guess that's the story of the dream that is referenced briefly in 'Blue Skies'. Still not doing it for me though, Tezza. Well, we have plenty of other 'shared' albums.